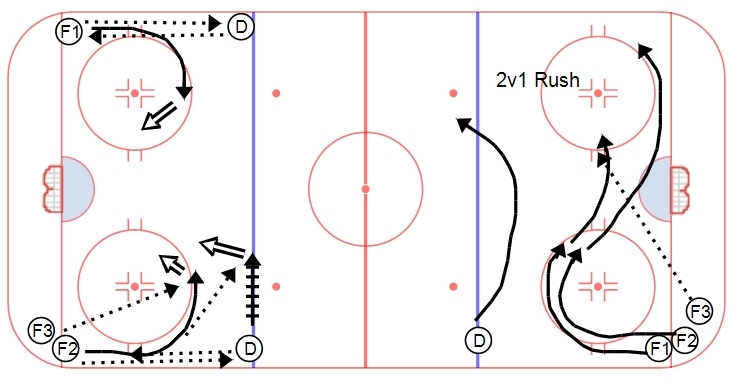 A multi-part offensive zone skill drill that ends with a 2v1 rush. Everyone goes out of the same corner, but for simplicity in diagramming I split the drill into top and bottom (in the left side of the rink). F are all in one corner, D at the blue line. F1 pass to D, receive a pass back while accelerating up around the circle. Take a shot on net and stop at the net. F2 pass to the D, get it back, D walk the line and receive a second pass from F2 and take a shot. F2 then receives a 3rd puck from F3 for a 3rd shot. After the three shots off the circle, F1 and F2 get wide and receive a pass from F3. D gaps and plays F1 and F2 attacking on a 2v1 down ice. The drill goes out of both ends at the same time – all F’s leave out of opposite corners.